the Friends of Minack Society decided to see if it was possible to have two daffodils named for them. We had no idea when we began if this would be possible and where to begin the quest needed a bit of investigation and several telephone calls before we found the person who could make this dream come true. 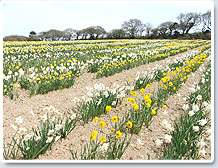 The person we were lucky to find was Ron Scamp renowned Cornish daffodil grower, very successful exhibitor, and expert at growing old, while also developing new, varieties of daffodil. Two committee members set forth to meet Ron at his beautiful growing fields near Falmouth in early April of 2010 when two flowers were chosen from those yet to be named. Ron generously registered these two daffodils with the R.H.S,. on the 1st of January 2011 for the Friends of Minack Society, for which we are hugely grateful. are a fitting, living tribute to Derek and Jeannie Tangye.